Treat yourself to this adaptable beige/natural small stags Christmas Oilcloth in matte. Such a fun and funky Christmas Oilcloth Design. This will enchant both young and old alike. Grab this Nordic inspired Oilcloth whilst stocks last. We have an extensive range of Christmas Oilcloth, Acrylic, Christmas PVC Tablecloth and Table Protectors for your home. One of our festive Xmas tablecloths wipe clean tablecloths will add so much to your decorations. With designs that include Santa, snowmen, baubles and even polar bears there is certain to be a festive tablecloths for you to buy here. 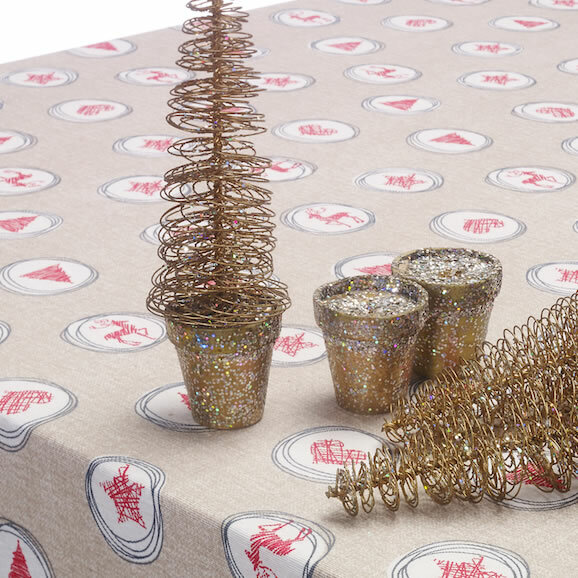 Christmas Oilcloth Tablecloths are perfect for the festive period. Christmas is the time of year when our dining tables get the most use A wipeable Christmas tablecloth is perfect at this time of year. Protecting your table whilst adding the final Christmas decoration. Christmas tablecloths have changed over the years and with a wide range of Christmas PVC Tablecloth the range of colours has changed. Whilst Red Christmas tablecloths have always been the de facto colour for Xmas Tablecloths. However we now have a range of grey tablecloths, beige tablecloths and even cream.